​This story is republished from page 3 of the 2016 issue of Berkeley Optometry Magazine. ​A statue of a boy leading a blind middle-aged man sits in front of the World Health Organization’s Geneva headquarters as a poignant reminder of African river blindness. 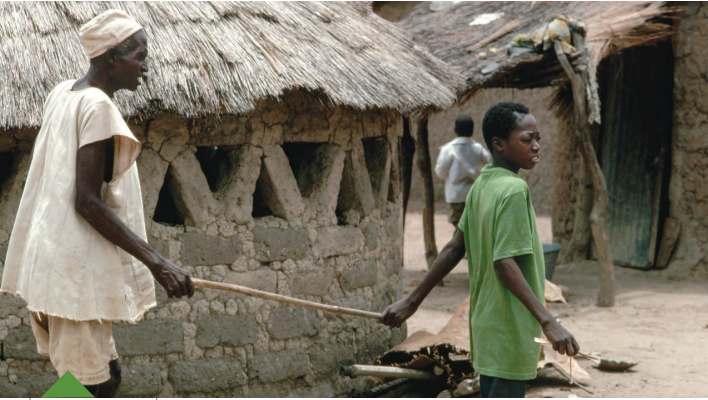 At the disease’s peak in the 1970s, half of adult males in 11 West African countries went blind around the age of 40. The statue has a subtext: the boy in the lead already carries Onchocerca volvulus, the parasite that eventually will cycle the blindness for yet another generation. Onchocerciasis is often called African river blindness for the habitat of the black fly that spreads it and the continent where more than 90 percent of the blinding cases occur. But at its heart, this ongoing public health saga is the story of a worm. When a worm-ridden fly bites a human, it injects larvae into the bloodstream as it takes a blood meal. The larvae grow into adults, who mate underneath the skin. The new generation of baby worms, or microfilariae, migrate throughout the host’s tissue, and cause intense itching as they die. As the microfilariae migrate, a bacterium piggybacks along for the ride. “We’re parasitized by the worms, and the worms are parasitized by bacteria,” explains Berkeley Wellness Letter Editor John Swartzberg, a professor emeritus of public health, who lectures for the School of Optometry’s systemic infections class (co-taught by faculty members Karen Walker-Brandreth and Patsy Harvey). “It’s our immune response to [both] the presence of the worm and the bacterium that causes inflammation in the eye and tissue destruction,” he says. Over decades, inflammation from repeated larval migrations leads to lesions that cloud the cornea, impairing vision and ultimately causing blindness. Inflammation of the optic nerve can also lead to vision loss or blindness. Meanwhile, uninfected flies pick up the larvae not just from the river, but also from biting infected humans, perpetuating the insidious parasitic cycle. To escape the flies, people abandoned rich river valleys for less productive land, exacerbating hunger in the region. In the 1980s and ’90s, the African Onchocerciasis Programme, a unique U.N.–led collaboration between the World Health Organization (WHO), the World Bank, drug giant Merck, and the U.N. Food and Agriculture Organization, dispatched teams to the region to address the crisis. UC Berkeley insect biologist Vincent Resh, now a professor emeritus, led the attack on the vector—the flies. He oversaw larvicide applications to the rivers, ensuring the chemicals harmed neither the people nor their river-based fisheries. Resh says that working closely with locals and distributing Merck’s donation of the drug ivermectin, an anti-worm agent that is effective in killing both the microfilaria and the adults, were keys to what he calls “one of the most successful public health interventions ever.” By 2002, the cost-effective program had prevented 600,000 cases of blindness, eliminated blindness risk for 18 million children, and reclaimed 150,00 square miles of land for food production, according to WHO. Despite these enormous successes, the CDC says the worms are still the second biggest infectious cause of blindness, second only to trachoma. That’s because the parasite’s 10 to 14–year life cycle makes it intractable. But a recent twist opened up a new line of attack. Scientists found that killing the bacteria sterilizes the female worm. “These two things have been together for so long they’ve evolved into mutual systems,” Swartzberg says. That means that long-term application of an anti-worm drug together with antibiotics to kill the bacteria would shut down the disease completely.